While OMEGA will forever be linked with the Omega Speedmaster Professional, the brand has not shied away from creating other types of watches. The Omega Constellation, available for ladies and gentlemen, evinces an elegant mien. The Omega Seamaster collection, with its close links to the ocean, includes the Ploprof, a diver’s watch with an impressive water resistance of 1200 metres, and the Aqua Terra > 15,000 gauss exhibits incredible resistance to magnetic fields. The brand has produced models featuring an array of complications including the rattrapante, annual calendar, perpetual calendar, and tourbillon. 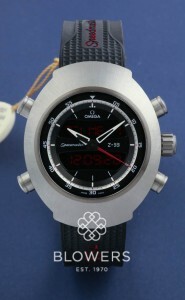 Blowers Jewellers stock a sizeable range of pre-owned unused and used Omega watches. 0% finance available. All watches on our website are physically in stock at our Kingston upon Hull boutique, and can also be viewed by appointment at our London Mayfair office. Browse our range below.